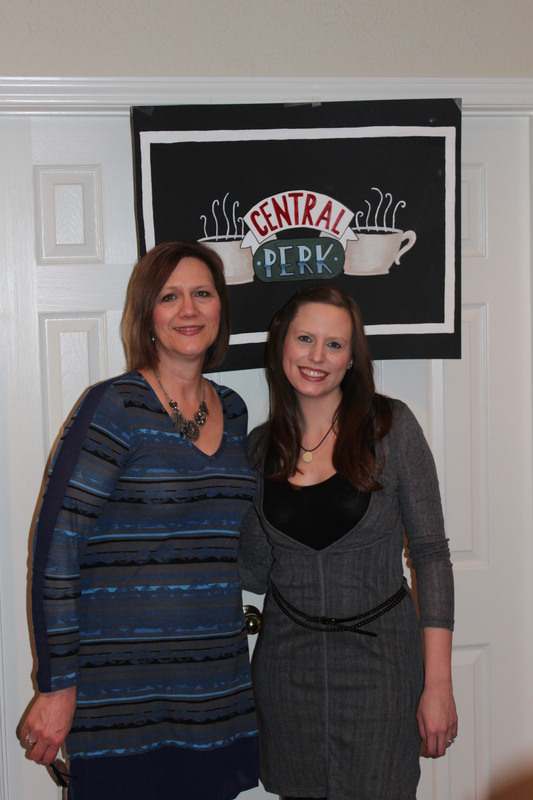 Unique Bridal Showers – A “Friends” TV Show & Central Perk Themed Party | mrs. and the misc. 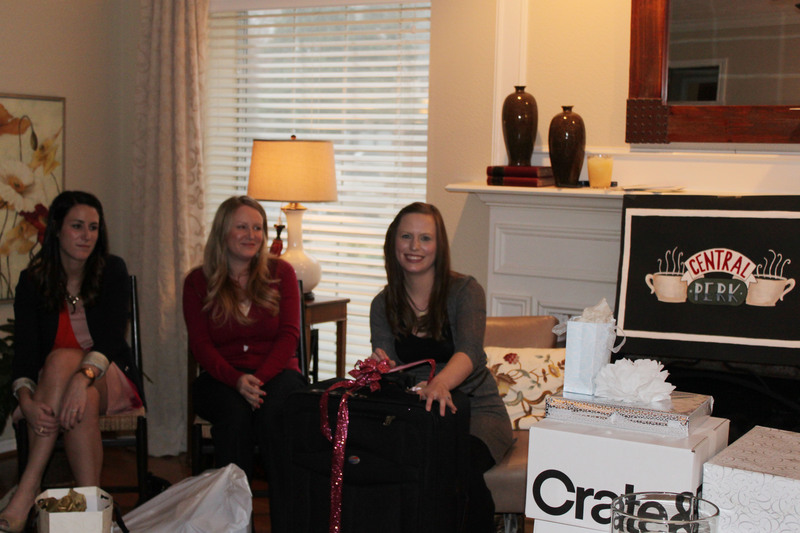 I’ve been DYING to post about the bridal shower I’ve been planning for one of my very best friends in the entire world. I have to say, I am pretty proud of the theme I chose and how it turned out. My friend Stephanie and I met our freshman year at the University of North Texas, and it was no doubt fate, because we both went to poli-sci class the first day with the game plan of making a friend. The rest is literally 10 years of history (10 years in August!). 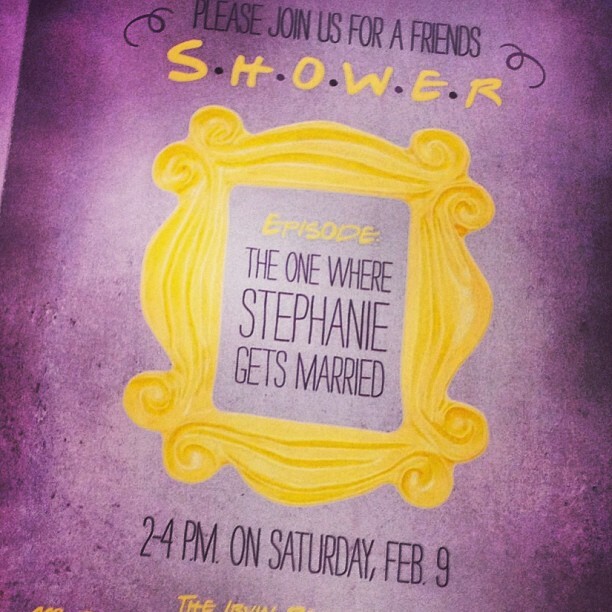 Mrs. Fincher hand painted this for the shower!!!!!! AMAZING. 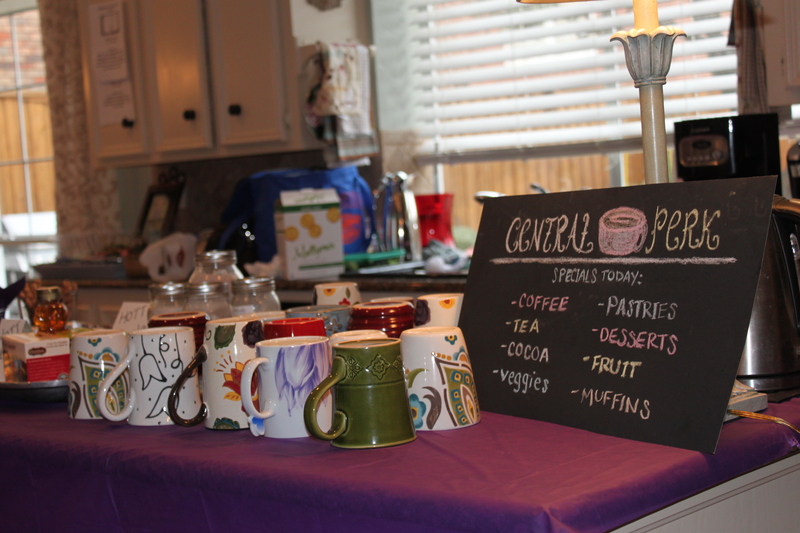 Just like at Central Perk, guests were served out of cool different coffee mugs. My mother-in-law and sister-in-law happen to have a HUGE collection of mugs, so it worked out PERFECT! 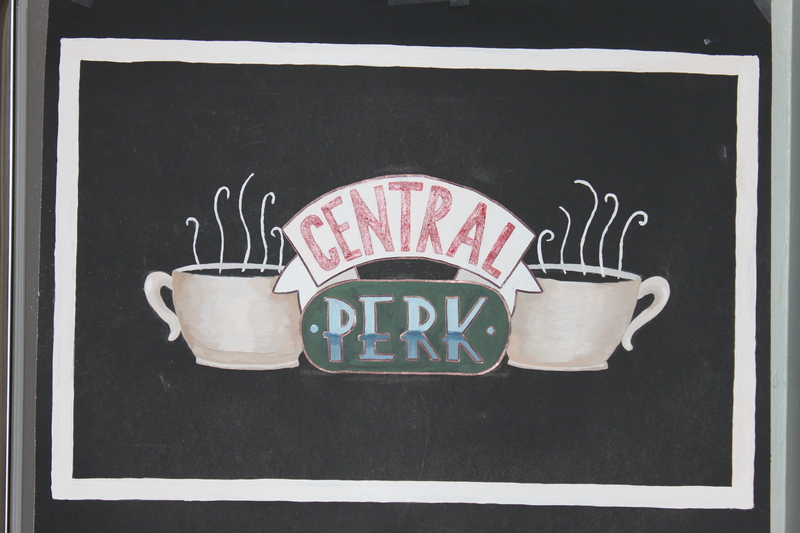 Mrs. Fincher also drew the menu board in chalk! 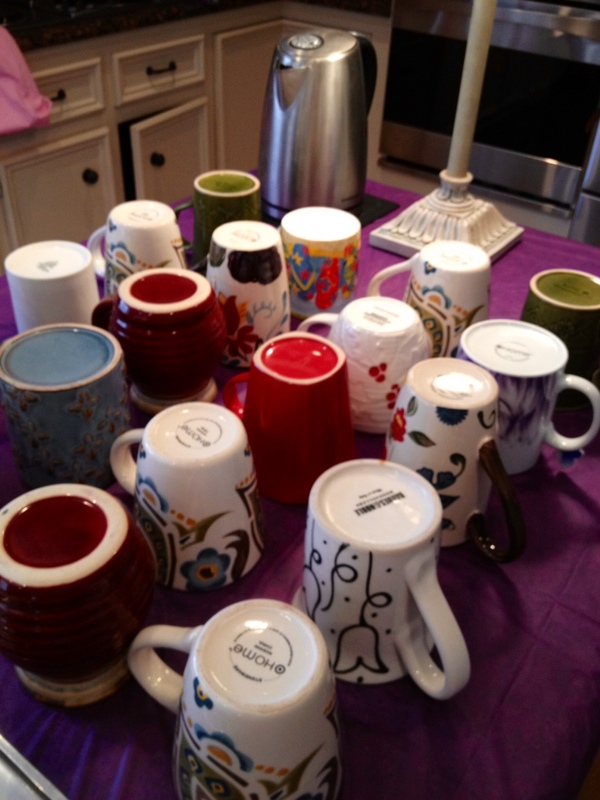 Another view of the pretty mugs. 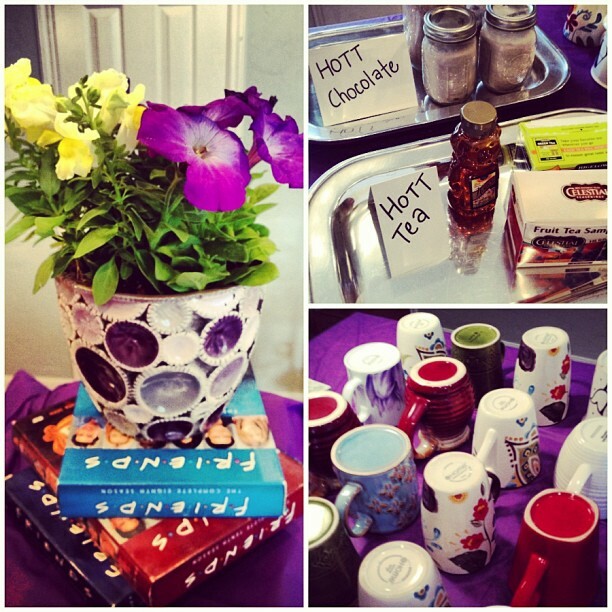 The tea and cocoa stations. 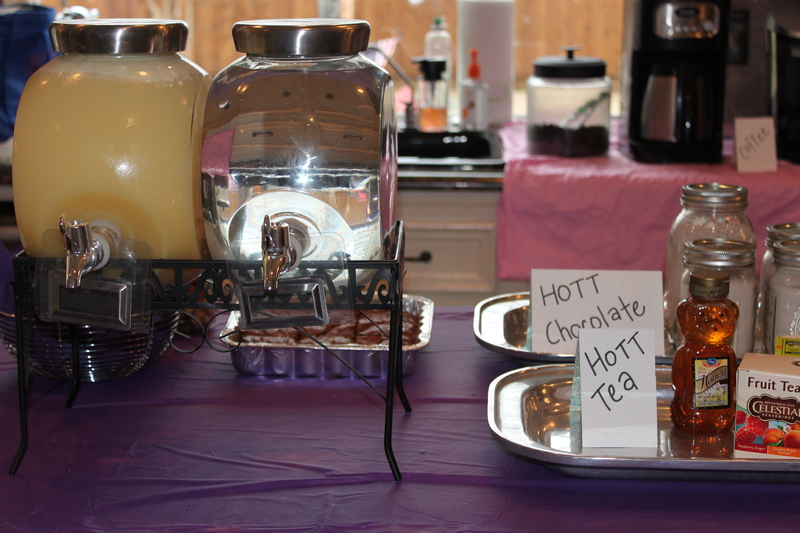 HOTT is the bride’s last name … it’s not a misspelling. 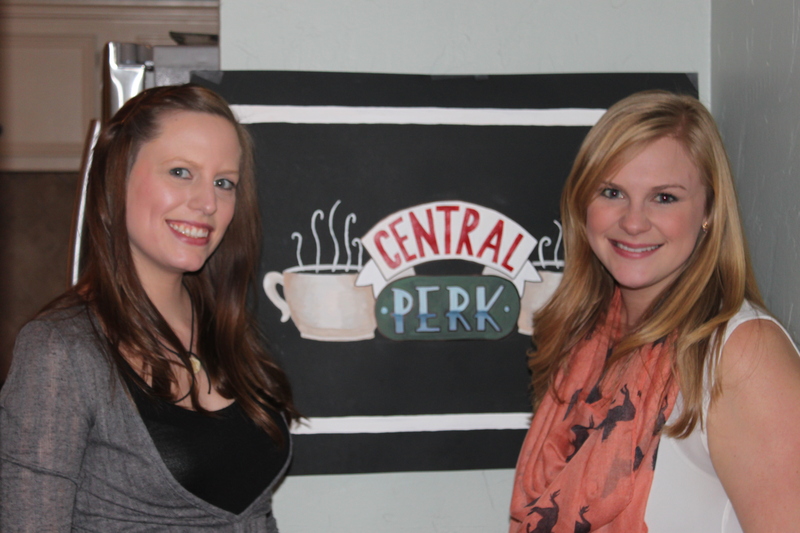 Giant mugs – like the ones on FRIENDS and in the Central Perk sign on the show – were used to hold the party silverware. 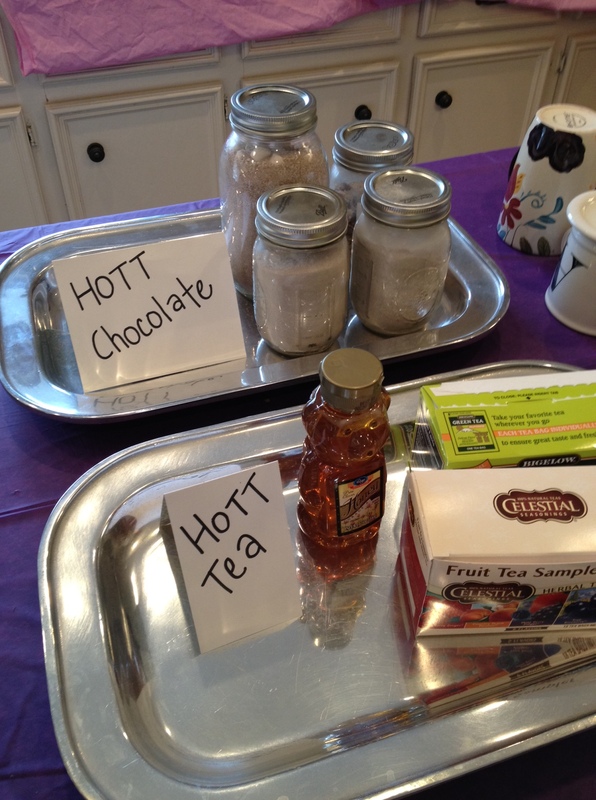 Beverages: an incredible Southern Living punch made by Mrs. Christensen, ice water, HOTT tea, HOTT chocolate (the bride’s last name is Hott, by the way!) and coffee (in the background). My little Instagram collage of shower details! 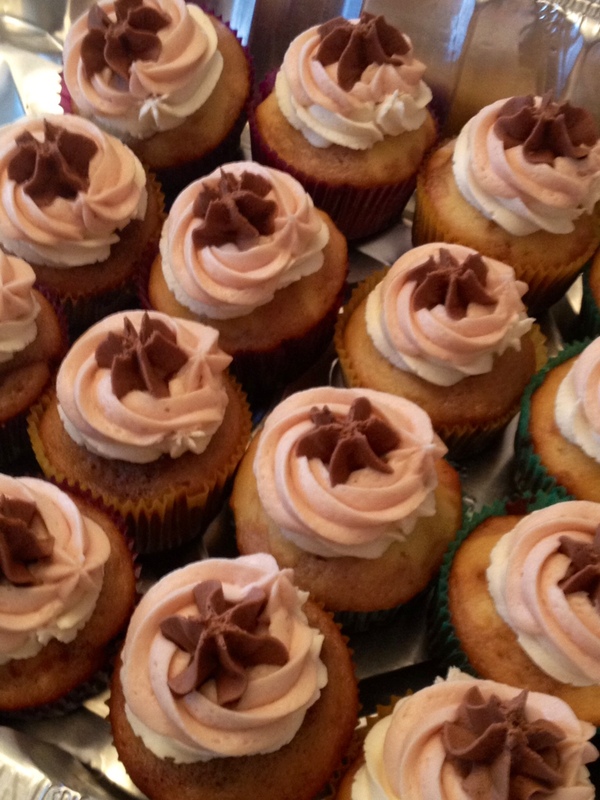 Amazing Neapolitan cupcakes made my the bride’s soon-to-be sister-in-law, Mrs. Bouchard. She and her friends Jami and Addi were big helps in planning too! They all had FANTASTIC ideas and inspired me. 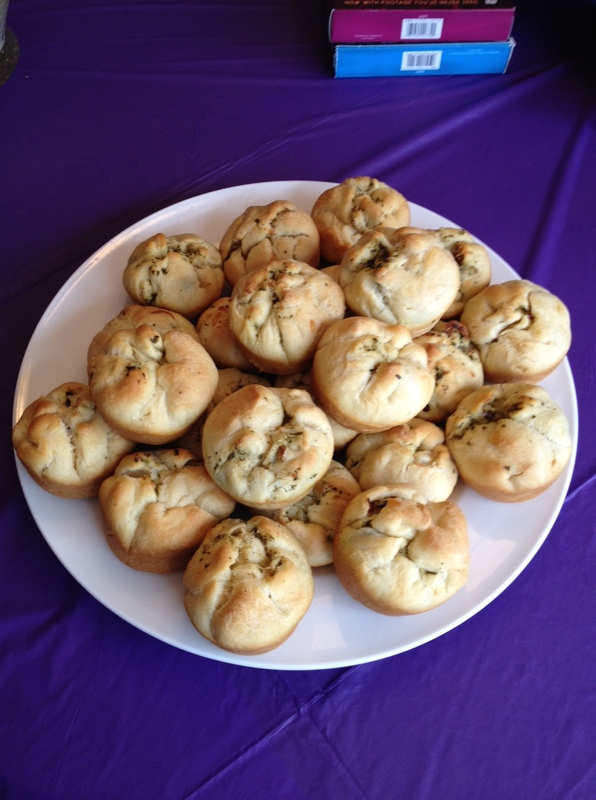 For something a little savory, but still café-esque, Jami made chicken pesto muffins with sun-dried tomatoes. 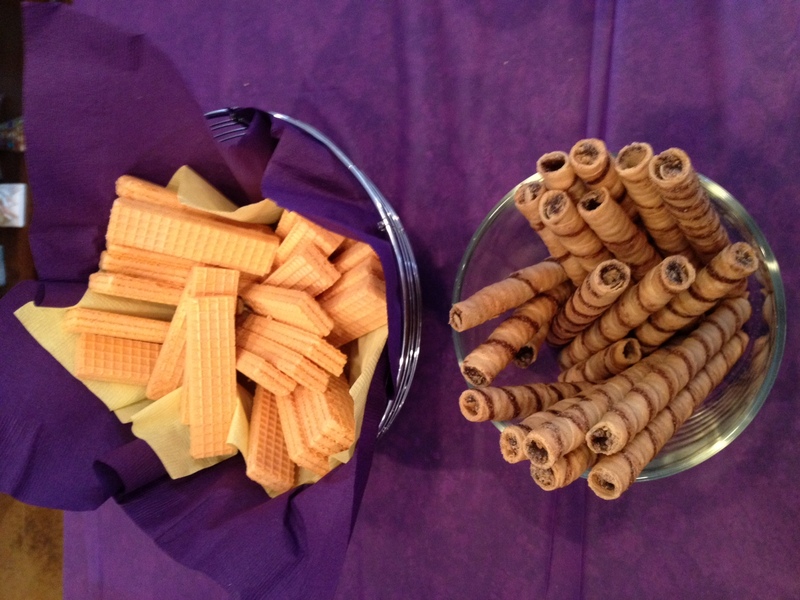 Vanilla wafers and pirouettes for the hot cocoa station! 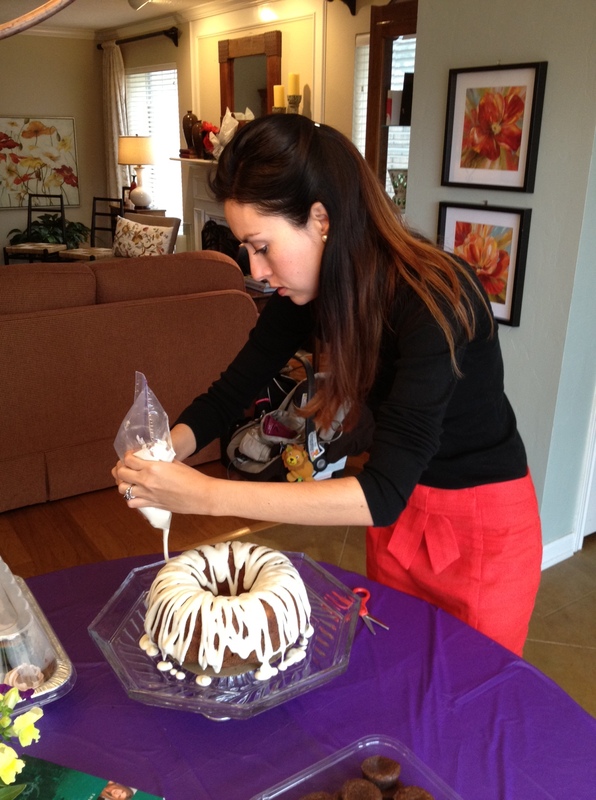 Mrs. Christensen icing her INCREDIBLE bundt cake. 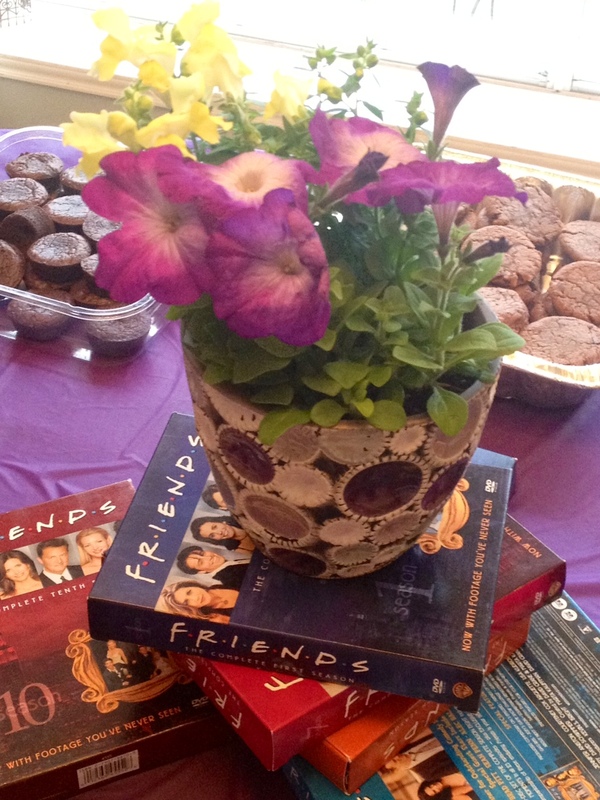 As you can see, I used DVD box sets of FRIENDS within the decor. Also, and this is a MONEY SAVING tip, y’all: Instead of buying a bouquet of flowers for $20, I went to Home Depot and bought two plants ($1.48/each) to put into a vase I already owned in the party colors – which are clearly purple and yellow! Then, I left the flowers for my mother-in-law, as a thank you for letting me use her house. 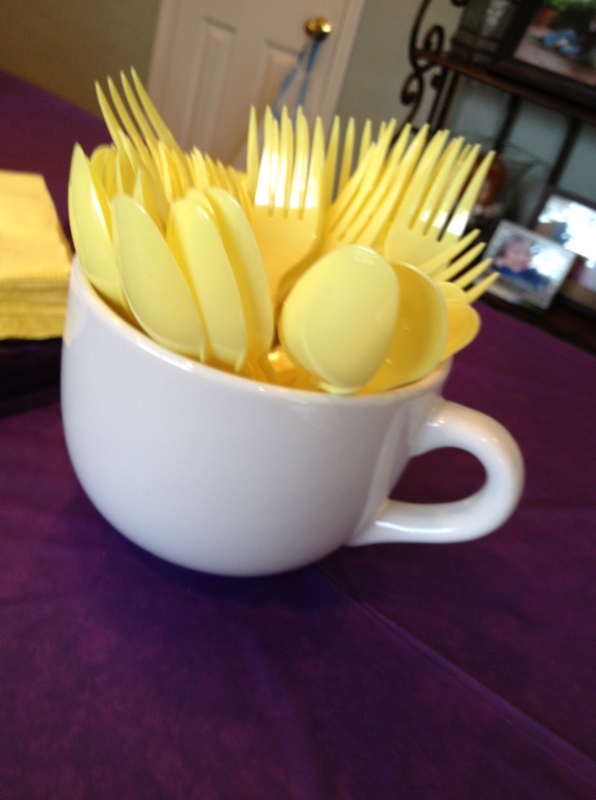 A two-in-one gift for the hostess and decor for party! 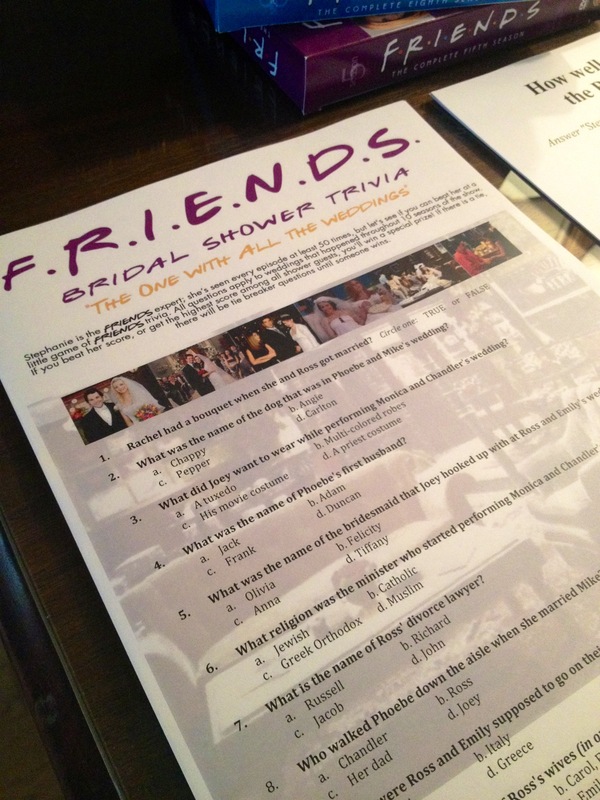 Guests competed to see if they could beat the bride on wedding-themed FRIENDS trivia. She won, of course, but her aunt (who claims she never watched the show) came the closest. The prize for the winner of the FRIENDS game. 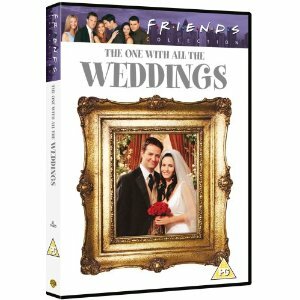 I originally wanted to put the DVD on the big TV behind where we were doing gifts, so that wedding episodes were flashing in the background, BUT the dvd player didn’t work. Would’ve been on mute, so as not to bother guests, but it didn’t end up making a difference. 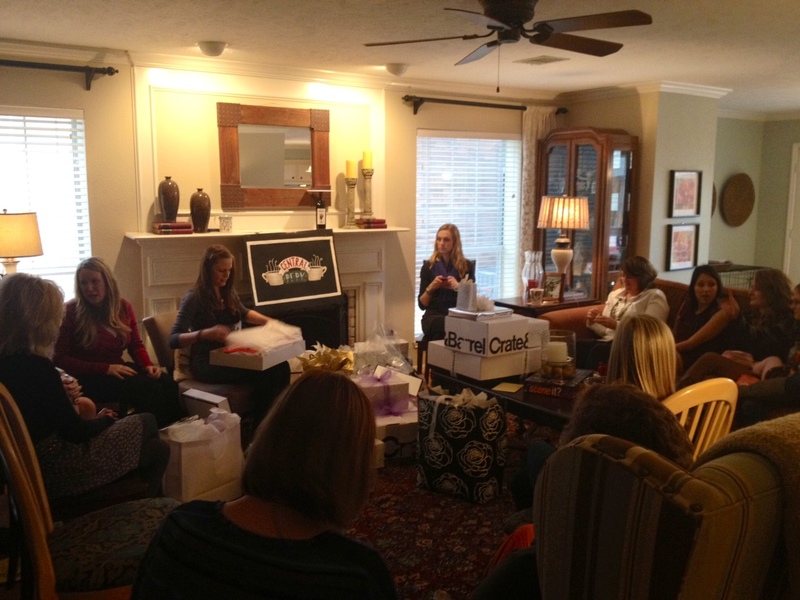 WANT TO HOST ONE JUST LIKE THIS? Pingback: Creative Sleeping Beauty Party, Princess Aurora Birthday Party, Grace Turns Three | mrs. and the misc. 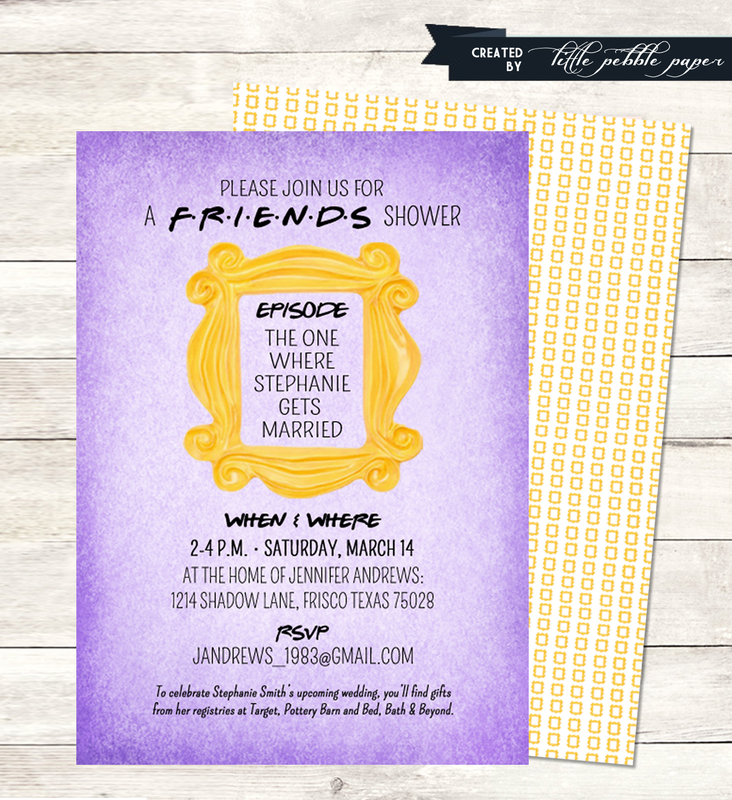 Pingback: Top 10 FRIENDS-themed Shower Ideas for hosting the ultimate FRIENDS party | mrs. and the misc.